You are here: Home / Tech Articles / What Hydrogen Storage is Best for Me? 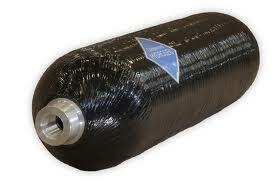 Compressed Hydrogen cylinders are usually the most readily available and economical solution. Usually, the most cost effective solution for testing or in some stationary applications is to simply rent/buy Hydrogen cylinders from your local gas supplier, often the local welding supplier has hydrogen readily available on short notice. These tanks are often Department of Transportation (DOT) certified (not always though, confirm with the manufacturer if you determine you need a DOT certified tank) and are lighter than the standard steel cylinders used by the gas supply shops. They are available in a variety of sizes (and pressure ratings) from the various manufacturers, and custom versions are also available if you are willing to pay extra. Be aware that lead time on these tanks are often quite long (6-8 weeks) unless you just happen to catch them with inventory (which doesn’t happen often). Some even come with integrated pressure regulators and safety valving, which is convenient. Metal Hydride hydrogen storage is a pretty cool technology where the Hydrogen molecule is actually adsorbed into a metal matrix. This results in gas storage densities that are higher than liquid hydrogen (on a volume basis). This makes metal hydrides great for applications that are restricted in space, but not in weight (or cost, usually). Metal hydrides typically store hydrogen at 4-8 weight %, not including storage vessel or other storage system requirements. This means 100 kg of MH material would store 4 – 8 kg of hydrogen. With the containment, balance of plant, etc, expect realistic numbers to be half of that. The BL-120 metal hydride has a Hydrogen Capacity of 120-135 standard liters (4.6-5.19 scf) and a recharge time of ~9 hours. Metal hydrides adsorb hydrogen at low to around room temperature and moderate pressure and release at higher temperatures. The exact temperatures/pressures depend on the specific metal hydride compound chosen. Since the metal hydrides release heat when they adsorb hydrogen, they must be cooled when being filled (some smaller systems may not need active cooling, just remember the bottle will get warmer and cooler, the faster it can adsorb the hydrogen). In order to get the most hydrogen from them, they must be heated to release the hydrogen. This all requires additional systems and controls. But I still like the metal hydrides; the science is very cool to me and it is great for certain applications where you can afford to have a much heavier system in exchange for storing more hydrogen in a smaller space. Check out all of the Metal Hydrides on our online store. The most common of these is Sodium Borohydride (NaBH4) , but there are a number of others. These are certainly very cool in theory, and I believe some companies are at or are ever close to commercial viability. Borohydrides have a pretty high hydrogen density and are actually one of the few hydrogen storage methods that are approved for use and transport on commercial aircrafts. Their two biggest drawbacks, in my experience (which, granted, is a bit limited) is that they use water and a catalyst to release the hydrogen which is impractical to re-fill/regenerate the Borohydride by use (must change cartridge). The fact that it can’t be easily recharged by a user isn’t really that big of a problem if the supply chain is there to support it and you can go to your local Quickie Mart or Walmart and get refill cartridges. Or if you’re not a consumer application and can handle your own supply chain/logistics (i.e. military). The needing of water and a catalyst to release the hydrogen has been a problem in many of the systems I have seen. The water and NaBH4 create kind of a slurry/mud that has a tendency to clog tubes and reactor chambers (where the catalyst is). Having said all this, I believe there may be a few companies who have overcome these problems (if you’re out there let us know in the comments). I know there are many other Hydrogen storage methods out there. What storage methods do you prefer for your application? what about palladium for a storage medium , What is the capacity and release method. So, you have bought a Fuel Cell and are ready to start using it. Or are you? ….